I have downloaded the 14 files (12 raw + 2 jpgs). You mentioned you want to maximise the details in the moon. With that in mind, I took one of the raw files and processed it individually in ACR and PSE to remove noise and enhance the details as best as I could using Levels, the Unsharp mask and a couple of other tweaks. I then opened the 12 raw files into PSE and applied Elements+ Noise Stacking script to remove the noise and then applied my usual adjustments as per above. 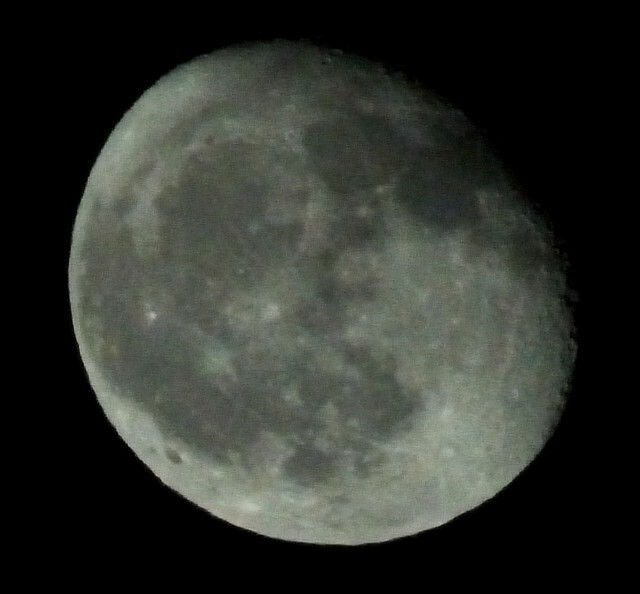 The only editing I did to your 2 jpgs below is a 100% crop around the moon. 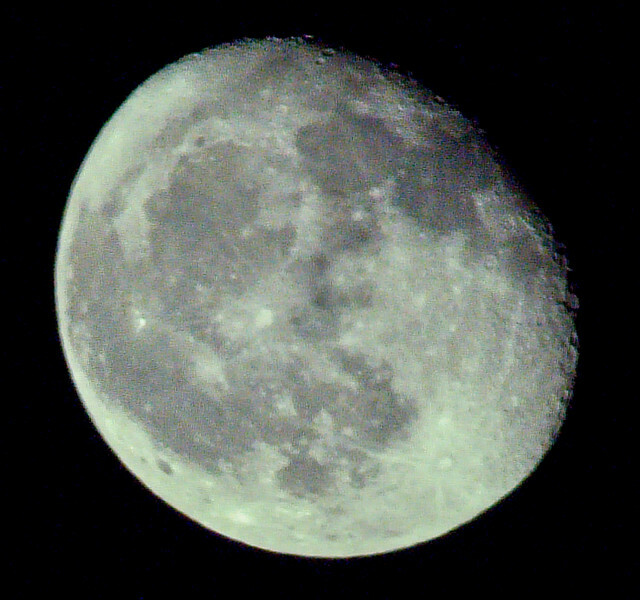 I did the same 100% crop around my 2 processed images. The moons in your original 4000px x 3000px raw files are too small for me to see much meaningful detail. I, or anyone really, could spend more time fine tuning the images, but these should give you an idea of the types of results you can expect using ACR for noise removal or Elements+ Noise Stacking for noise removal. As I suggested in an earlier post, I suspect during totality where your shutter speed and/or ISO will be much slower and higher respectively than in these photos, the noise stacking technique will not produce best results for the reasons I posted. To minimise the chance of disapointment, I still strongly suggest you take at least some shots during totality that you will be able to post process individually without relying solely on noise stacking for noise removal. Thank you Bailey The results you achieved using ACR are impressive. I must try to increase my ACR skills. I then opened the 12 raw files into PSE and applied Elements+ Noise Stacking script to remove the noise and then applied my usual adjustments as per above. Your results using Elements+ are far superior to my results using Elements+ 18! The raw files uploaded were 100% untouched (with the naming change excepted). You've made me revisit the entire noise stacking experiment --- Thanks again! If you haven't already done so, perhaps consider doing a test similar to below to determine if aligning images during noise stacking is likely to be an issue or not so that there are no nasty surprises during post processing with the actual eclipse images. During totality, your exposure settings will most likely be ~7 stops longer than when the moon is fully lit by the sun. Your shutter speed during totality will be around 0.5s, depending on the aperture and ISO settings. Because of the longer shutter speed, the total time to take a 12 shot burst will be at least 6s. The moon will move quite a bit in your frame over 6s, especially at focal length 600mm. 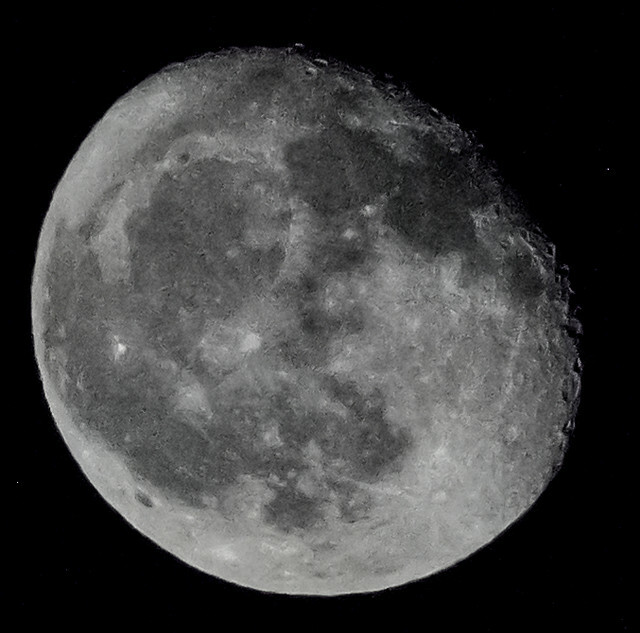 The next time you have a chance to photograph the moon, doesn't matter what phase it is in (as long as you can see it of course), set your aperture and ISO to suit a 0.5s shutter speed. Then take a 12 shot burst of images and run them through the noise stacking script. Based on the results, adjust the shutter speed up or down to determine the slowest shutter speed at which the noise stacking script can still align the images. That will be the slowest shutter speed you will be able to use on eclipse night if you intend to use noise stacking to remove noise.